Back in 1982 I went out to visit my friend, Bryan Stoller, whom I had grown up with in Ottawa but who was at that time aspiring to become a film director in LA after having graduated from the American Film Institute. Bryan had made some contacts within several of the studios, enabling us to visit the set of the series, Bret Maverick, filming at Warner Brothers, where I got to meet my hero, James Garner. I've written about this at great length in this previous post. 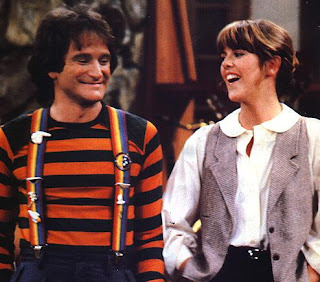 But Bryan also knew a producer at Paramount, and was therefore able to get us onto the set of the popular sitcom, Mork and Mindy, which was pretty much what had launched the career of Robin Williams, playing Mork, the alien sent to study earthlings. When we arrived on the set, the cast and crew were busy rehearsing for that week's show, with the director setting up camera angles as the actors went through their paces. Bryan and I went up into the empty stands where the audience would sit for the taping at the end of the week. I had brought along my sketchbook and so I started sketching the cast while they rehearsed. 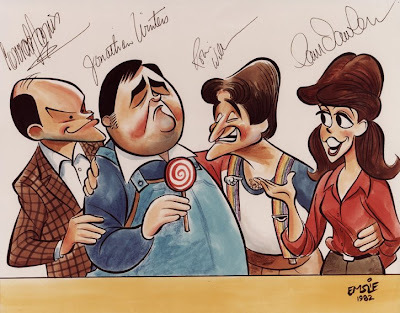 This was to be the final season of the series, and Jonathan Winters had joined the cast as Mork and Mindy's (strangely fully grown adult) baby, Mearth, hatched from an egg laid by poppa Mork. (Okay, the 70s really was a strange decade!) The main reason that Winters had been added to the cast, however, was that he had been the lifelong comedic idol of Robin Williams, who had patterned his own scattergun style of improv comedy after this comedy legend. One of the most memorable events while watching this rehearsal came when the cast took a short break while the camera crew set up the next shot. Jonathan Winters had wandered over to a chair on the set and had started a one way conversation with it. Robin noticed what he was doing and was soon joining in on this madcap bit of improv with the chair. It was really neat to see how these two guys, the master and his disciple, worked off of each other, obviously having great fun with such off-the-cuff invention. After they were through with the rehearsal, Bryan and I went down to say hello to the cast and the producer, Gene Sultan, who had kindly given us permission to visit the set. I showed them the quick sketch caricatures I'd been doing and the cast members were quite excited with them. We accompanied them back to their breakroom for coffee and to chat for a bit, and they asked if they could photocopy my sketches. Interestingly, I found Robin himself to be a bit quiet and reserved, quite unlike what I would have expected. 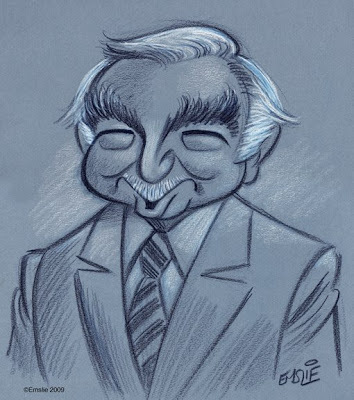 In contrast, Jonathan Winters was very outgoing and funny, and even sketched a cartoon for me! I must admit, though, that I was most of all enjoying the company of Pam Dawber, who played Mindy. Pam was just as cute and sweet in person as she was on the show, and I came away quite smitten! As our visit wrapped up, the producer gave us tickets to come back and attend the show's taping at the end of the week. I couldn't believe how gracious they had all been and I wanted to do something for them in return. Once I had returned back home from my trip, I decided to work up the rough sketches (as well as some new ones I drew from the TV show) into a finished piece of art. Actually, I did three identical originals, then mailed them to Bryan with the instructions to keep one for himself as thanks, and to give one to the producer, Gene Sultan, and hopefully see if he could get the cast to autograph and return one to me. Bryan came through, and several weeks later I received my original back, signed by the cast, as well as an 8 x 10 photo reproduction of it. 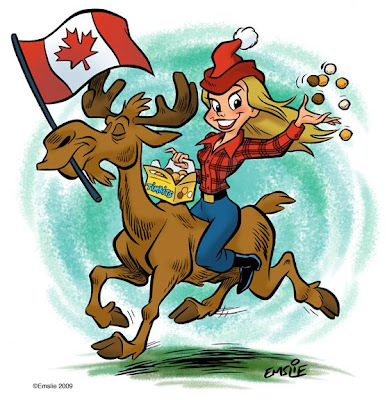 There was also a note from the producer, thanking me for the caricature and hoping that I didn't mind him taking the liberty of having it printed up and distributed to all the cast and crew at the end of season wrap party. Of course I was flattered that he had done that, happy that they all had a momento of their final season that featured my art. I'm afraid I missed this guy's birthday by a few days, as it was on July 8th. But a belated Happy Birthday nonetheless to Marty Feldman, one of the funniest characters to grace the movie screens in both Hollywood and his native England. Though Marty had an unfortunate defect of the eyes, he was able to turn this bizarre physical trait into a successful career as a much beloved screen comic. 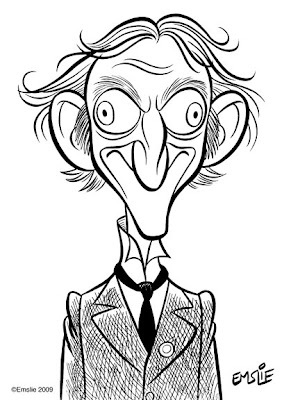 In order to draw this sketch, I watched him in 1975's The Adventure of Sherlock Holmes' Smarter Brother, where he costarred alongside actor (and first-time director) Gene Wilder. In truth, it's a pretty weak film, although it boasts some quite nice atmospheric visuals and lush colour. Also, it was shot in England, thereby giving them easy access to some terrific British character actors, including Leo McKern (as Prof. Moriarty), John Le Mesurier, and Roy Kinnear. Much better of course was the film where Wilder and Feldman had first costarred together the year before: Mel Brooks' Young Frankenstein, considered now to be a comedy classic. Marty Feldman played the assistant, "Igor", (humourously pronounced "Eye-gor", as Feldman points out when his character is first introduced), whose hump seems to migrate between the left and right side of his back. This was the film that firmly established Feldman as a screen comedian in America, although he'd already been a big star on British TV for a number of years. One very bizarre film that I recommend seeing him in is The Bed Sitting Room, a darkly funny, post nuclear holocaust film, where Marty Feldman plays a female nurse that has mutated into...well... a bug-eyed little man! Sadly, Marty Feldman left this world far too soon back in 1982, the victim of shellfish poisoning that triggered a massive heart attack while he was in the midst of shooting his final film, Yellowbeard. He was only 49 when he died.